Oreo is launching a global creative platform, called “Stay Playful,” starting with a North American TV campaign featuring musician Wiz Khalifa and his five-year-old son. The new platform, from The Martin Agency, follows the “Wonderfilled” platform also created by that agency. Launched in May 2013, Wonderfilled was the basis for numerous campaigns over the years, including 2015’s “Play With Oreo” and last year’s “We Are Oreo People” — both of which featured people having fun and connecting through dunking, twisting apart and otherwise playing with the cookie. “Playfulness has always been part of the Oreo brand’s DNA, and now with ‘Stay Playful,’ the brand is outwardly establishing its playful spirit as the core of all creative communications,” said parent company Mondelez International, in announcing the new platform, which will span digital and social media, as well as television. 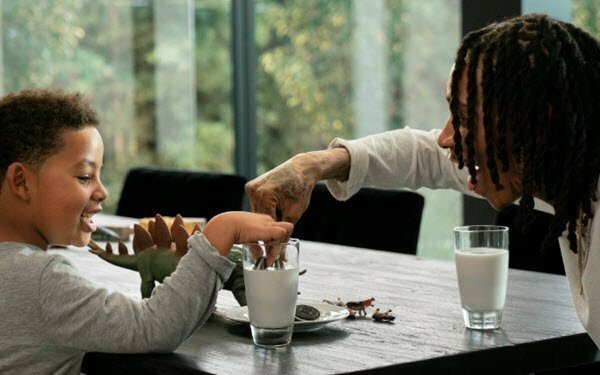 Khalifa recorded an original song, “Playful 4 Life,” for the soundtrack of the new ad (15-second version below), in which he and his son Sebastian are shown enjoying fun activities like indoor bowling -- and dunking Oreos. “They say we’re too grown for fun? We say playful’s never done,” declare the song’s lyrics. A 30-second version of the spot will debut during the Grammy Awards on Feb. 10. The brand introduced the Oreo Music Box — a miniature turntable that plays music when you put an Oreo cookie on it — in the United States last November, as part of a limited-edition holiday package sold on Amazon for $19.99. Oreo won't be selling the new-edition music boxes; instead, the brand will give them away during Grammy Awards Sunday. For chances to win, fans will need to visit Oreo.com on that day.